Kick off your KIBO teaching with a one-hour, interactive videoconference PD session! We are excited to share instructions, tips, and best practices to help you get started teaching with KIBO. 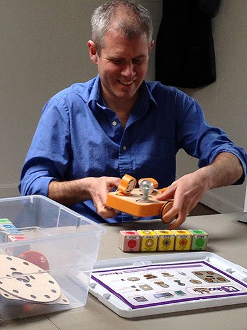 Join us for a one-hour professional development web-conference introducing KIBO. In this session, we'll show you how to use KIBO's parts and programming, discuss teaching with KIBO, and answer questions. Purchasing this item allows you to select an available slot in our training schedule. Generally, we offer training slots on Tuesdays at 10:00am and Thursday at 2:00pm, Eastern time. You'll join a scheduled session with up to 3 other participants, plus our trainer. Please note: After purchasing this item, you will receive an email with instructions on how to sign up for an available slot. Please be sure to provide your correct contact email address during checkout.